Rahul Dravid, Andrew Flintoff and Shoaib Akhtar got arrested consuming alcohol which is a severe offense in Saudi Arabia.For the terrible crime they are all sentenced 20 lashes each of the whip. The Sheik announced: "It's my first wife's birthday today, and she has asked me to allow each of you one wish before your whipping." Flintoff was first in line, he thought for a while and then said: "Please tie a pillow to my back. "This was done, but the pillow only lasted 10 lashes & Flintoff had tobe carried away bleeding and crying with pain. The Pakistani was next up.After watching Flintoff in horror he said smugly: "Please fix two pillows to my back. "But even two pillows could only take 15 lashes & Shoaib was alsoled away whimpering loudly. Then Rahul Dravid was the last one up.The Sheikh turned to him and said: "U are from the most beautiful part of the world & your culture is 1 of the finest in the world. For this, you may have two wishes! 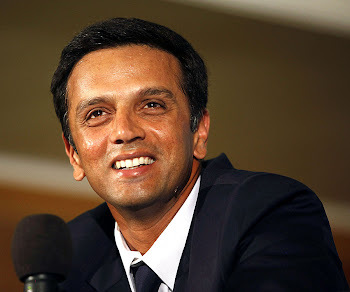 ""Thank you, your Most Royal and Merciful highness," Dravid replied. "In recognition of your kindness, my first wish is that you give me not 20, but 100 lashes. ""Not only are you an honorable, handsome and powerful man, you are also very brave. "The Sheik said with an admiring look on his face. "If 100 lashes is what you desire, then so be it. And what is your second wish, ?" the Sheik asked. Dravid smiled and said, "Tie Shoaib to my back"!!! Though it's a joke created, I am not surprised becuase Dravid is an intellectual person.